While they used to turn you away at 10:30, El Pelon is keeping their doors open just late enough to catch those who get shut out from Anna's and Boca at 11. Instead of 11:00 am - 10:30 pm, their new hours are from 10:00 am - 11:30 pm. That's an increase of two hours per day! Rejoice. 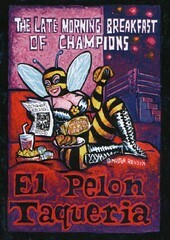 This entry is filed in El Pelon Taqueria. Wednesday, March 30, 2005 by Jonah.